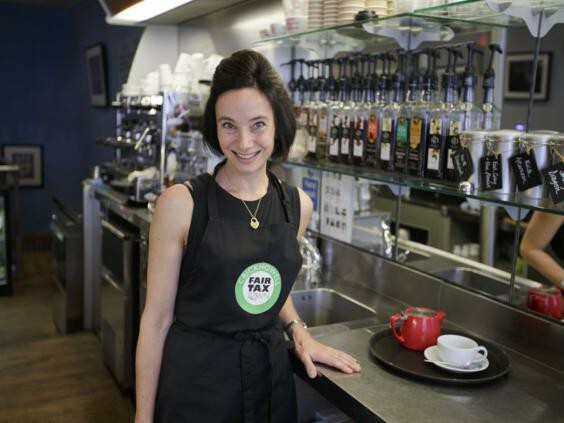 Last year, Steven Lewis, owner of a small cafe in Crickhowell, Wales, paid £31,000 in corporate income taxes. Facebook also does business in the UK, and is likewise subject to UK tax. Although Facebook had estimated UK revenues of £389 million in 2014, the company only paid £4,327 in corporate taxes — about 1/7 what Mr. Lewis paid. All over the world, multinational corporations take advantage of loopholes to avoid paying taxes, aided by “free trade“ treaties that ensure that corporations are under no obligation to serve the interests of the people or governments in the countries where they do business. Of course, this gives multinational corporations yet another advantage over their small, locally-owned competition. Threatened by the likes of Starbucks and Amazon, Steven Lewis and the small business owners of Crickhowell decided to take matters into their own hands. First, they attempted to incorporate their town and its businesses in offshore tax havens — a tactic favored by multinational corporations. 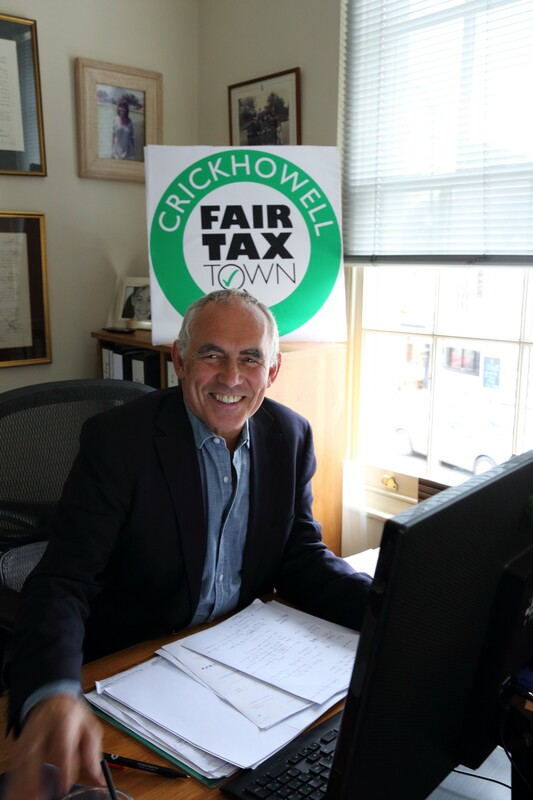 The British tax authorities told them that neither Crickhowell nor its small businesses qualified. 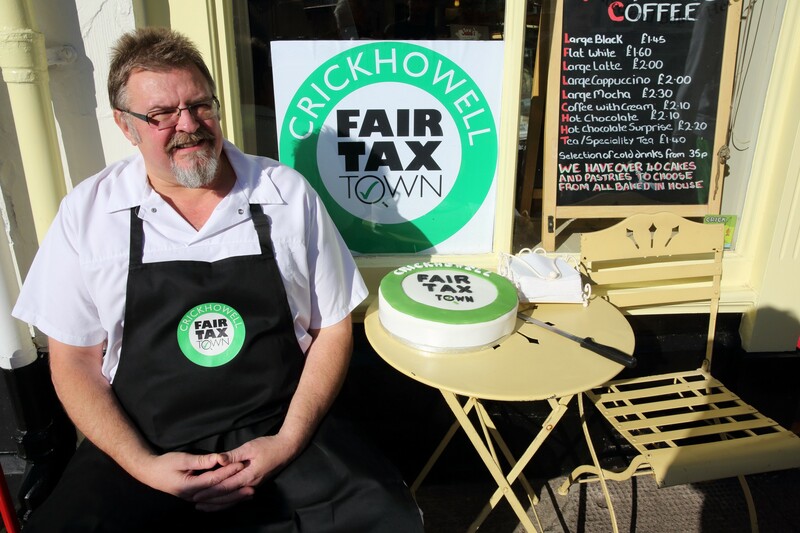 Undeterred, the Crickhowell business owners set up a company to take advantage of the “Dutch Sandwich” (a loophole created when a company is “sandwiched” between the UK and a tax haven), and learned how to use Intellectual Property (IP) rules to reduce the profits they declare and, in turn, the taxes they pay. Though this is not a lasting or systemic solution to the problems of economic globalization and deregulation, it is a clever way to shine a light on one important way that the system is rigged against local businesses. 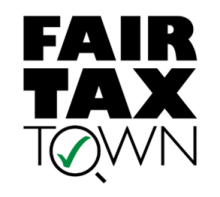 One of Fair Tax Town’s strategies is to shame corporate tax avoiders — and the governments that let them get away with it — through mainstream and social media campaigns. It can seem impossible for individuals to do anything these days that will capture the attention of corporations or governments, but public image does count for something, and when sweet grandmothers stand in front of their family-owned bakeries and say they’ll cheat the tax system until Facebook stops doing the same, people may begin to listen. For more information, visit http://fairtaxtown.com, or read these articles from This is Money and The New York Times. For more about how trade agreements make it easier for global businesses to avoid taxation, check out this Global Justice report: Taxes on Trial: How Trade Deals Threaten Tax Justice.